"I Can Fly" summer youth cohort with mentors in the Harambee Garden. This summer a new youth leadership program gave a cohort of Chicago teens a safe and nurturing environment to learn lessons that enriched their lives, as well as the neighborhood where they live. 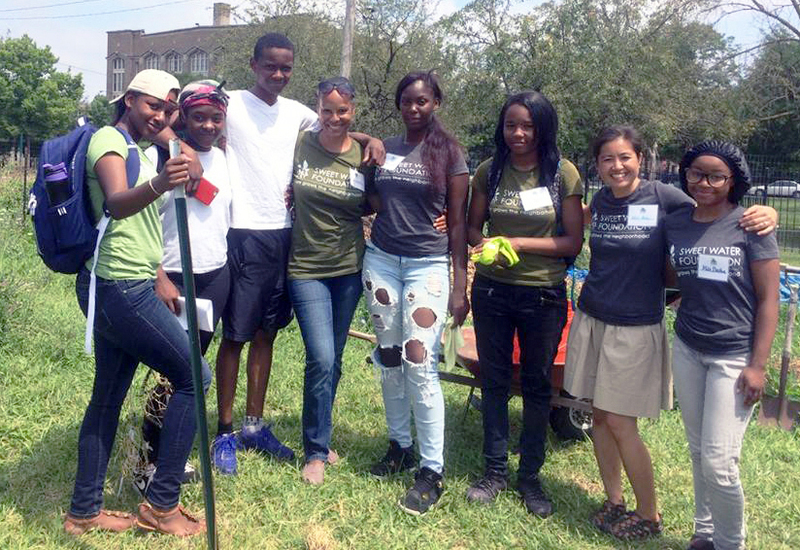 During July, teens in the “I Can Fly” Youth Leadership Program focused on the richness of the soil, not the economic poverty around them; the sweet fruits of labor, not the bitterness of systemic discrimination. They learned art -- culinary and fine – as well as the art of negotiation, compromise and hard work. They learned to trust in their own leadership power as well as a higher power. The program was punctuated by a rich Speaker Series and four engaging field trips, but mainly the teens learned about these issues while building butterfly habitat, staking tomato plants, and pulling herbs and greens for alfresco lunches in the garden. The program participants live in the Austin neighborhood on Chicago’s West Side, which is rich in people and resources: gorgeous Columbus Park, strong community groups, an active religious community, affordable homes and apartments, and a vibrant African American culture. But Austin is also plagued by gun violence and poverty. All of the teens who attended the leadership program have been touched by the trauma of losing people they know to gun violence. “We always hear that bullets are flying in Austin. I wanted to focus on something other than bullets,” says Doris Davenport, program manager for I Can Fly. The program was sponsored and supported by Green Community Connections (GCC), which is extremely grateful for a tremendous outpouring of community support, including a generous grant from a private donor. A number of smaller donors contributed healthy meals and tools like shovels, gardening gloves and water bottles. I Can Fly youth use energy generated by the blender bike to make smoothies with Cheryl Munoz of Sugar Beet Schoolhouse. Six teens from Frederick Douglass Academy High School earned full stipends to attend the July program every day. Seventeen others from Becoming a Man (BAM) and St. Martin’s Episcopal Church joined them one day each week. The program launched with a kickoff screening of "Can You Dig This? ", an audience favorite at One Earth Film Festival. The event included a rich post-film discussion of the film’s portrayal of urban agriculture renaissance in Los Angeles’ Compton community and what that might look like in Austin. 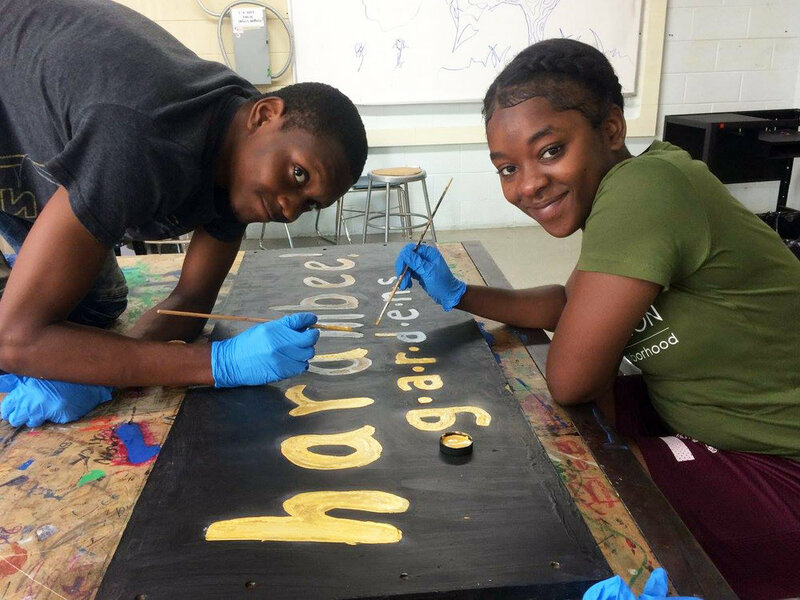 The teens used Harambee Garden, run by Root Riot Urban Garden Network, as their home base to learn gardening and other life lessons. Cheryl Munoz and Aniki Shani of Sugar Beet Schoolhouse showed them how to sow seeds, water sprouts, and prepare healthy meals to enjoy the harvest. Native plant expert Stephanie Walquist of West Cook Wild Ones helped teens plant native gardens and understand the needs of monarch butterflies and other pollinators. Horticultural therapist from Chicago Botanic Garden, Vincent Gomez, beautifully guided the teens through therapeutic gardening activities. Artist Tia Junes Etu helped the teens build stunning artwork that functions as garden signage. Loretto Hospital offered space where the teens installed a double-sized native garden. Former Governor Pat Quinn talked with the kids about leadership and proved to be one of their favorite speakers. Michael Strautmanis of the Obama Foundation talked with kids about the power of taking a risk and has pledged to mentor the kids over this next year. The cohort attended engaging field trips to Sweetwater Foundation, the Chicago Botanic Garden, and Sugar Beet Schoolhouse. Community-building expert Susan Lucci coordinated an incredible culminating trip to see Van Jones' We Rise Tour at the Chicago Theater. In a large sense, the I Can Fly Leadership Program was a response to the constant stream of stereotypical images of unemployed “inner city” kids. While the teens certainly gained a lot of confidence and real-world experience, the adults also benefited. Visit the Harambee Garden to see the I Can Fly Garden at the corner of Race and Waller Avenue in the Austin neighborhood. Be sure to enjoy the artistic signage the teens created. Listen to the Doris Davenport Show on Sunday evenings from 6 to 8 p.m. on 1490AM WPNA. Become a mentor or donate money or time to Douglass Academy High School, where 100% of graduating seniors were accepted to college in 2017. Learn about Becoming A Man (BAM). Learn about St. Martin’s Episcopal Church. Join State Representative Camille Lilly’s and Illinois Senator Don Harmon’s email lists to follow legislation affecting sustainability and resilience in Austin and Oak Park. Call their offices to encourage state funding of mentoring programs. Donate to support Green Community Connections’ programs for youth and sustainability. Participants paint new signs for the Harambee Garden.